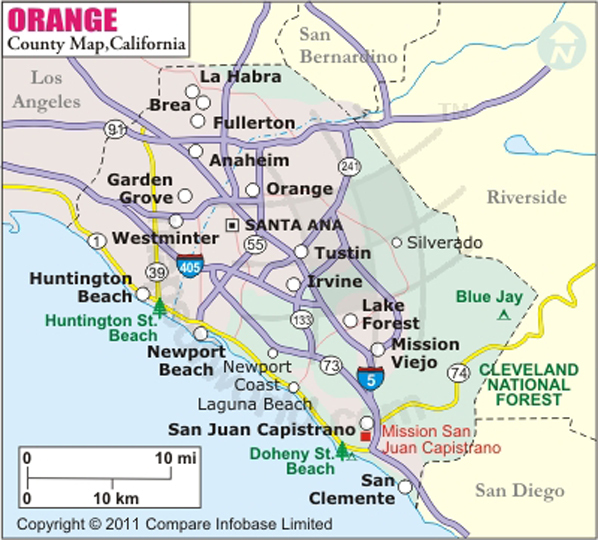 Below is Map of Orange County in California showing the boundaries, roads, highways, towns and much more. Though Orange County (OC) is the smallest county in Southern California, it is the third most populous county in the 'Golden State' and the sixth most populous county in the US. In fact, it has more population than 21 US states. Santa Ana is the county seat. Anaheim is the most populated city while Irvine is the largest by area. The OC borders the Pacific Ocean (southwest), Los Angeles County (north), San Bernardino County & Riverside County (northeast), and San Diego County (southeast). Its northwestern region lies in the Los Angeles Basin while southeastern region rises into the Santa Ana Mountains. The county features blissful 42 miles of surf and sand along the sun-kissed Pacific coast. The county has carved an image in American consciousness with top-ranked theme parks, boxy mansions, and gorgeous sunsets. Disneyland in Anaheim remains one of the most visited theme parks in the world. Unlike its ultra-urban neighbor, Los Angeles, the OC is proudly suburban in character. The county is the backdrop of several television series, The OC, Real Housewives, and Arrested Development perhaps being the most popular. Whether it is playing Frisbee at Huntington Dog Beach, riding the waves at Newport Beach, or wandering around Laguna Beach, every stretch in the Orange County's coastline has its own charm. Knotts Berry Farm, Mission San Juan Capistrano, Crystal Cove State Park, and Bowers Museum are other prominent attractions in the county. John Wayne Airport (SNA) is the primary airport in Orange County. Amtrak operates Pacific Surfliner, a regional route, through the region. On road transportation relies majorly on three highways: Santa Ana Freeway (I-5), San Diego Freeway (I-405), and San Gabriel River Freeway (I-605).